Roulette is widely known as a game of chance, which means that gamblers’ skills are not so important for winning possibilities as in some other gambling games while the role of luck is the most crucial factor that determines mainly whether players would hit the house or lose. Nevertheless, gamblers have always tried to increase somehow their chances of winning and develop various methods in order to do this. Roulette game is organized so that the dealer spins roulette wheel and the ball in the opposite directions after gamblers made their bets trying to guess correctly which number would be hit with the ball. Casino roulette wheel has 37 or 38 slots depending on the game’s variation, which are colored red and black and numbered in such way that there is a balance between odd/even and high/low numbers. However, sometimes the balance is violated and the wheel is said to be biased. In other words, biased wheel means that some of the numbers depicted on it are hit more often than the others and players, who are able to detect such ‘hot’ numbers, could bet on them and win more often than those, who are in the dark about the bias. 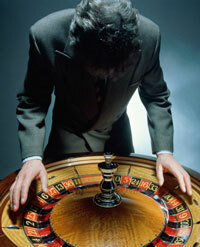 There are a lot of cheating methods connected to wheel tampering, among which are physical widening certain slots on roulette wheel, so there would be more chances that the ball hit such positions, or unbalancing movable disc with pockets, so the normal roulette wheel performance would be interrupted. Another wheel tampering method is to use some sticky or elastic material inside the certain slot, so the ball would hit exactly the needful position. The Savannah move means that players place they chips in a pile and in case of losing they are to take back some of the bottom chips so that the dealer would not see this. If gamblers are lucky to win they need to add some chips of high value to their bet and just claim that they have predicted the winning number correctly.